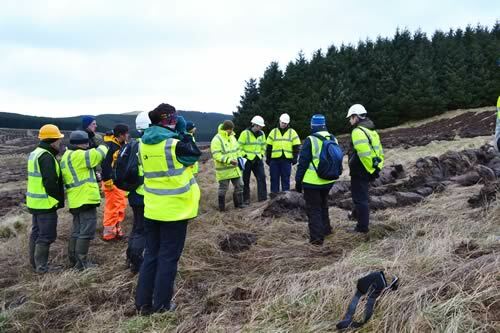 UPM Tilhill’s Central Scotland team recently hosted a site visit by 42 members of staff from the Scottish Environment Protection Agency (SEPA), Scottish Water and Scottish Natural Heritage to Warroch Hill woodland creation site, Milnathort. The visit was arranged following a request from Forestry Commission Scotland’s (FCS) Perth & Argyll Conservancy team based in Perth. The aim was to share UPM Tilhill’s diffuse pollution control plan that has been prepared as part of proposals to fell and restock an existing forest area, establish over 250 hectares of new productive woodland and construct a new forest road to facilitate management. Regulators and forest managers were able to come together to discuss all of the various aspects of protecting local water resources from diffuse pollution during forest management and woodland creation projects. The event also allowed UPM Tilhill to share the company’s best practice guidance which has been developed in collaboration with SEPA. A plan has been developed for the 356ha site that addresses a number of issues raised by FCS, statutory consultees and other interested parties. It details the process of assessing the site and identifying appropriate pollution control measures sufficient to minimise the risk of diffuse pollution being generated from ground preparation, drainage or roading operations. The aim is to avoid unacceptable impacts on high conservation interests in and around Loch Leven, Kinross. The property lies within part of the Loch Leven catchment – a designated Special Protection Area for its over-wintering geese and wildfowl populations. Loch Leven is the largest natural eutrophic lake in Britain which, due its high natural nutrient status, has high biological productivity. It is also an important fishery. UPM Tilhill, established more than 60 years ago, is a national company operating from a network of offices throughout the UK and is the UK’s largest forest management and timber harvesting company. The company provides a full range of consultancy and contracting services to the forest owner and forestry investor.